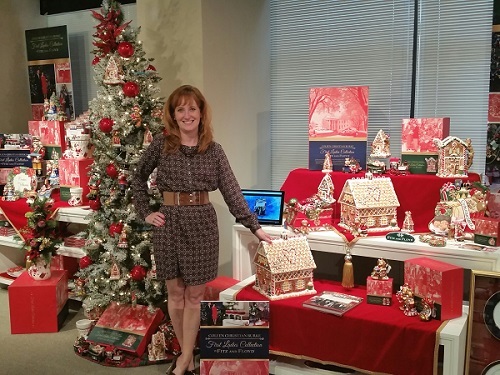 TWE Interview - Coleen Christian Burke - "Christmas with the First Ladies"
EYE: What made you go for a spot on the White House Christmas decorating team? What a challenge! COLEEN: I put my television career a little bit on hold and became a full time mom. For the sake of my children I got really into decorating for the holidays and then started Sugar Plums, a home-based seasonal holiday decorating business. 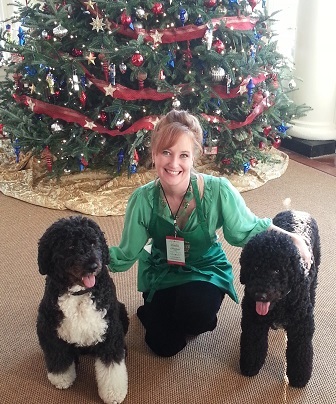 I was watching HGTV Goes To The White House on Christmas with my children. The television producer in me thought, “ I bet I could get on this production team.” I made the mistake of saying this in front of my children. I could tell them 100 times to clean their room and they don’t hear that. But if you say, “Hey, Mom’s going to the White House to decorate one year!” That, they won’t forget! So, I made this bold boast in front of the kids and I decided to look into it. The television production team idea was a dead end, so I sent some of the pictures of the holiday decorating I’ve done. Maybe I could actually be a part of the decorating team, rather than the television production. The whole thing was kind of a lark. There really wasn’t any cost to me. But, it was something I stuck to because I wanted to teach my kids a lesson that because you get a “no” doesn’t mean you have to stop. 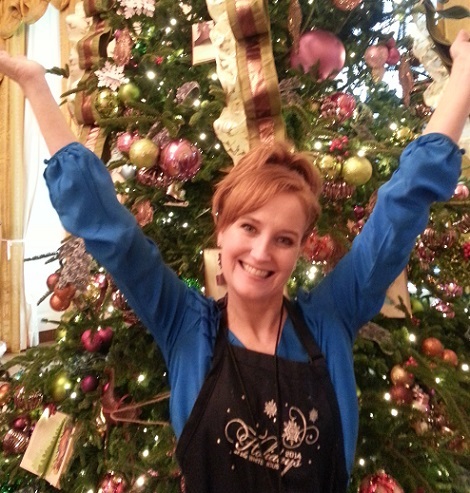 EYE: How did you ultimately get to the White House to participate in decorating for Christmas? EYE: Did you think it was for real? COLLEEN: I was a bit skeptical at first, but then as she continued talking I thought this really is Nancy Clarke. She said, “Shortly in the mail you will receive a security clearance from the Secret Service, fill it out, return it to us, and if you don’t hear from us, report to the White House for work the Tuesday before Thanksgiving.” I thought that sounded so crazy. If I don’t hear from them again, just show up? Sure enough we got this packet, I filled it all out, and I never heard from them again. So I thought, I guess I am taking a trip to Washington, D.C. and I won’t be surprised if I am turned away. This process just seemed so unofficial. When I got to the White House there was actually a group of other people who were standing around who had gotten the same instructions. At that point we boarded a bus and went to a warehouse facility, which seemed all very mysterious and glamorous at the same time, and the work began. EYE: How did the book come about? COLEEN: In chatting with other decorators there, I found out it was Jackie Kennedy who started the whole tradition of decorating and having a theme at Christmas. 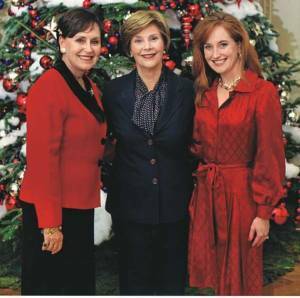 I was really impressed by Laura Bush and how much time she actually spent on the decorations; she really cared and communicated with us to get it just right. I didn’t think I’d really see her or she would be removed. So when I left the White House after that experience, I thought since Laura Bush had a very definite point of view and style, I wondered if the other First Ladies had a signature style. I just wanted to buy a book about it. I couldn’t find one. So, I fell back on my old producer skills and started researching it, with a hunch that it could possibly be a book. I found amazing pictures were available from the different Presidential libraries. As these historical treasures started showing up at my house, I really thought it would be a book. EYE: Is there a common thread to First Ladies’ vision in decorating? COLEEN: I thought Mrs. Clinton wouldn’t be that interested in the Christmas decorating. However, I found she actually went to great lengths and, of all the First Ladies, she mixed it up the most and tried to make it interesting, innovative, different and special every year. Sometimes the First Ladies’ mandate would come out in their decorating. Example: Laura Bush, as a librarian, loves literacy and books. She actually decorated with books hung on a tree and literary characters. When I worked with Mrs. Obama in 2014, we wanted to have a different take on that idea of books being really important. So we made ornaments of books that were opened and paper art popped out of it, like the book was coming alive. We also recycled books that libraries were throwing into the trash. Mrs. Obama’s concept of reusing and reinventing were coming out in decoration. For Jackie Kennedy, it was really important to have a manger, a crèche. Pat Nixon was the first First Lady to do tours by candlelight so people could visit the White House after work. 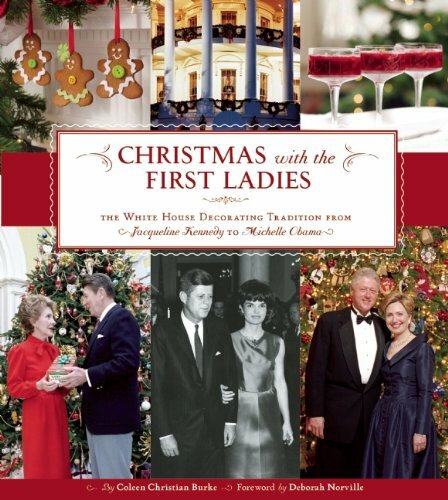 She was also the first to make the White House decorations accessible for the handicapped. What I think is consistent across the board is that they are all very conscious of it being “the people’s home” and they are decorating this home for the Americans who make the journey to go and see the White House at Christmas. Every year 100,000 people go to see the decorations and tour it at Christmas. 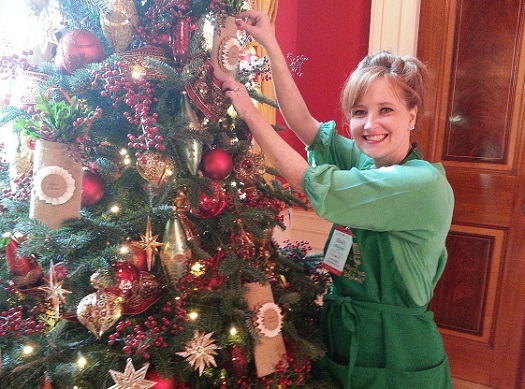 EYE: What impacted you most in your years decorating at the White House? COLEEN: One of the things Mrs. Obama always includes is a Gold Star Tree for the fallen service people. I was incredibly moved to have the honor to work with one of the moms of a fallen soldier. That very touching experience put it all in perspective. With all the stress, hustle and bustle and commercialism in Christmas, there is something bigger; it’s our common humanity. I think it’s really interesting that life can take a shape in something as simple as decorating. EYE: On your blog, by Coleen, you cover a variety of real life situations like back-to-school, decorating rooms, even healthy eating alternatives and a socially proactive project for used school supplies. How did that project come about? COLEEN: Into every life, there is some turmoil. Due to a very bad ice storm in 2014 our home had to be knocked down. We had the experience of losing everything. It’s a very unsettling feeling, almost like shock that this is happening. Luckily, we were able to stay at my mother’s home. My son added that he didn’t even have pencils or a pen or even a piece of paper to bring to school. 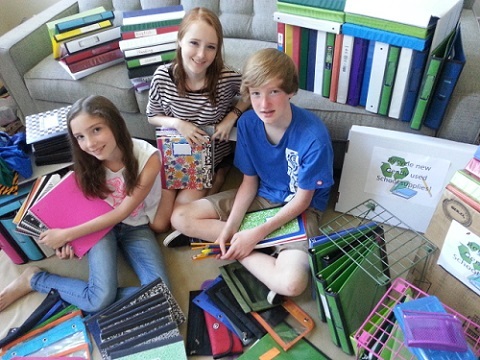 At the end of the year my kids watched their classmates throwing away their school supplies. They were the ones who came up with the idea of recycling them. They saw things in the trash that could be used. That came from the perspective of not having anything ourselves. You suddenly realize a pencil, a calculator, a binder is a special thing. We organized the recycling effort with the local Middle School. It was also important for me that the kids went with me to deliver these things, to actually see how those in need benefit. The thing about volunteering is that you end up giving to yourself just as much as you’re giving to someone else. Whenever I am at a career crossroads, or at a loss, I try to help others because I find that clarifies things for me. EYE: Do you have any advice for entrepreneurs? COLEEN: First, “no” means “not now.” “No” does not have to be definitive. It just means not at this time, not in this way. I feel like I always have a bag full of projects that I think are all interesting and viable. They’ve all been turned down or told “no.” I feel like I have to find a time to dust them off and bring them out to get traction on them. Next, if your dreams don’t fit any more, let them go. Gather up your dreams and see which ones work and which ones don’t. Expect to give yourself a pep talk and force yourself to do uncomfortable things. That is part of the process. There will be a payoff at some point. Finally, “Know what you don’t know.” Find the people who do know it and learn from them. Just because you don’t know it now, doesn’t mean you won’t in six months if you work at it. EYE: What drives you to be so motivated? COLEEN: It’s really the gift of confidence that I got from my parents. They believed in each of their children that they could do whatever they set their minds to. I saw my parents pursuing dreams, that didn’t happen. I was so enchanted with those two words, the creativity and the romanticism around “story teller” that I kind of feel like that has guided my career. Every job, every project that I embark on, I feel like those two words apply to it. When I was standing in that D.C. warehouse and then the White House I was standing in awe of all the historical stories around me. EYE: Is your life’s adventure something you dreamed about? COLEEN: I could never have planned this life out. If I were a little girl saying I am going to be a designer and design the White House for Christmas and then I’m going to install it and then I’m going to talk about it, it just would have been so far fetched. I never would have said that. Did I always think I was going to be a hard worker and be successful? Yes. But, I didn’t think this would be my journey. When I look back on it, it makes sense. There’s more at work in the universe that what my plans are. EYE: You collaborated with Fitz and Floyd to premiere the First Ladies’ Christmas tableware collection and ornaments in September of 2017. TWE wishes you success with not only that collection but also in all your endeavors! Thank you for your time and insights, Coleen! !